Heart On The Line: Carpet! It took a day and a half but the carpet guy is finally done and we're finally getting somewhere! I feel like the photos don't do it justice. 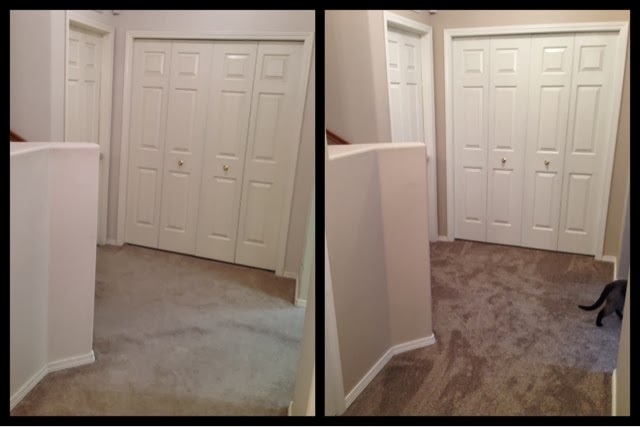 You can't tell how horrible the old carpet was and what a gigantic change the new carpet is! 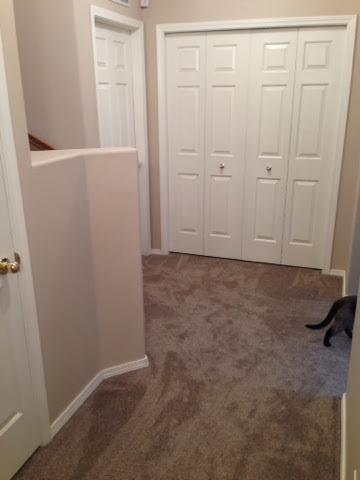 The old carpet was a very light grey and it was super worn and stained in a few spots, and after a water leak we had a few years ago, part of it had been pulled up and never properly laid back down. It was bad. Like really nasty. There was a hole in the wall in the stairwell from when we moved the treadmill down the stairs. There was some damage on the wall where the boys had hit their gaming chairs against the wall. 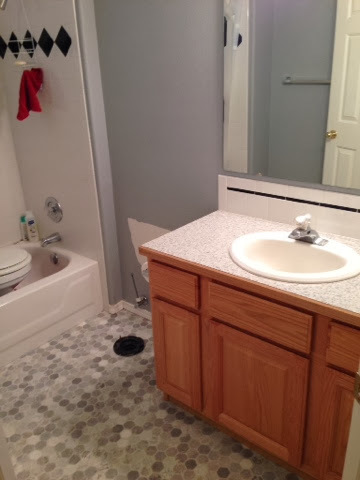 The vinyl floor in the bathroom had yellowed over the years for some reason and looked awful. Basically, the basement was in bad shape. Everything looked worn and dated and in desperate need of a facelift. Well it has definitely gotten a facelift! The painters repaired the damage to the walls and gave everything a fresh coat of paint that makes everything look clean and new. 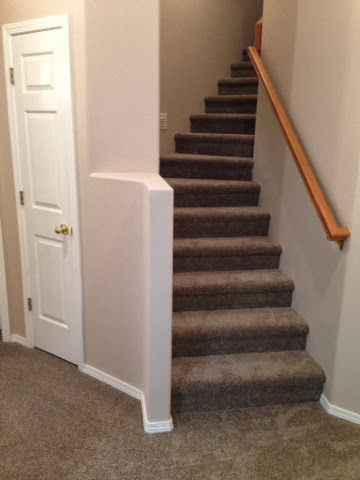 The old worn carpet was pulled out and replaced with the same awesome carpet we put upstairs earlier this year. It's soft and nice and pretty. We replaced the old worn out vinyl in the bathoom with a really cool updated vinyl that looks really pretty in there. It feels likes a whole new house down there! It's not done, of course. The furniture store is delivering all the furniture next Saturday. We still need to reset the toilet that we had to pull out for the vinyl installation. We have things to hang on the walls and we're putting blinds in the windows. All that will be done this week. But it's amazing to me how different it looks! Like I said, the photos don't necessarily do it justice. 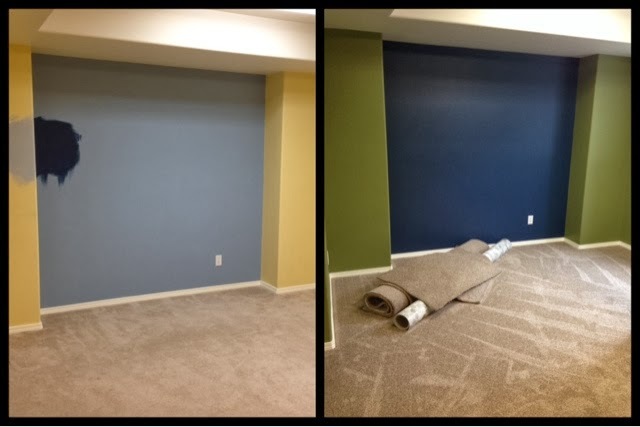 The old carpet doesn't look nearly as horrible in the photos as it did in real life and you can't tell how bad the walls looked. But trust me, it wasn't pretty. I will get more photos later. 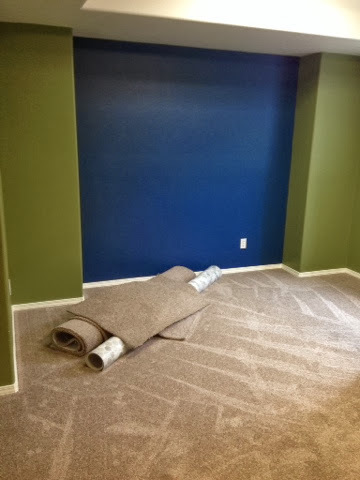 The leftover carpet is still in the TV room because we can't move it to the storage room until we get all the guest room stuff out if there that we had to move so they could recarpet. We'll do that this evening. I also haven't taken many photos of the TV room yet because I actually have a big blanket covering half of one wall so that it blocks the view from upstairs so we can hide it from the kids. I was going to cover the whole room and then I realized that you can really only see one small potion of the room from upstairs, so I got out my photography backdrop stand, draped a blanket over it and moved it in front of the wall so that it blocks the kids from being able to see what color the walls are down there or anything else that would give the surprise away. I'm determined for everything to remain a surprise until Christmas morning! My plan is to get out my good camera and take good photos when the whole project is 100% complete and I can share the whole thing. But for now, here is a taste of what is going on down there!! 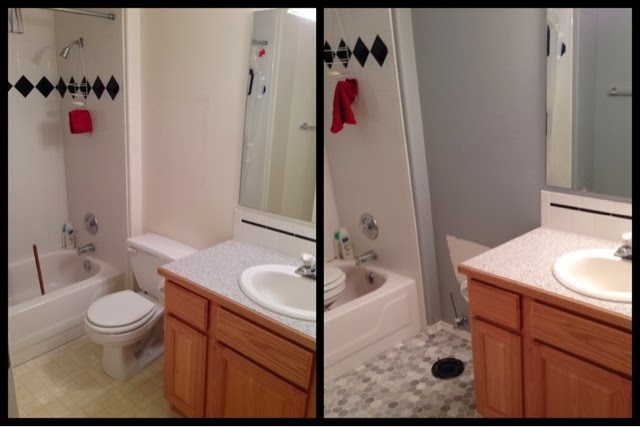 And here are a few before and afters! It's looking awesome! 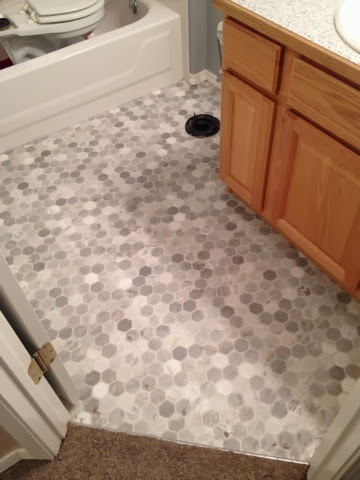 I esp love the floor in the bathroom!! You did a good job! !